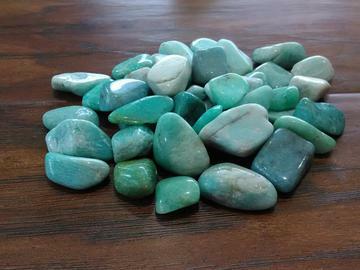 Amazonite (sometimes called "Amazon stone") is a green variety of microcline feldspar. The name is taken from that of the Amazon River, from which certain green stones were formerly obtained, but it is doubtful whether green feldspar occurs in the Amazon area. Amazonite is a mineral of limited occurrence. Great for tumbling and cabbing. Stones range in size from 1"- 3"